Can you bring a bottle of cheap wine to a restaurant? Can you bring a bottle of inexpensive wine to a restaurant? It is okay to bring an inexpensive bottle of wine to a restaurant under certain conditions. First, ask yourself why you’d want to bring in a bottle of cheap vino to a restaurant. It is a bad idea if the thought is to save money. Most restaurants take pride in preparing their wine lists. They want to match their food menu with a selection of wines with a broad price range. The reason you bring a bottle of wine to a restaurant is that it has a significant meaning to you. Examples: A wine you purchased on a wine country trip where you met the winemaker. A wine that is a vintage of a year you are celebrating, as in a wedding anniversary. Corkage guidelines for bringing an inexpensive bottle of wine to a restaurant. Your wine is not a mass-produced wine. Examples: Louis Martini Cabernet Sauvignon Sonoma or Meomi Pinot Noir are high production wines (over a million cases made). Your wine is not a second label wine as in Trader Joe’s, Kirkland or Cameron Hughes. The fancier the restaurant (Michelin star), the better idea it is to choose from the wine list. Always call ahead to find out what the corkage policy is a restaurant. Often in a restaurant’s corkage policy, they will charge you the restaurant wine list price for your wine if it happens to be on their wine list. If the corkage fee is high, $20 or more, your inexpensive bottle of wine becomes high priced. Of course, you can try bringing any wine to a restaurant. Manners are manners! I once witnessed a party bring in Two Buck Chuck to a Calistoga restaurant. * Each year I try to purchase a case of Napa Valley Cabernet from some of the big names. Robert Mondavi, Charles Krug, Conn Creek, and others. As long as I know the wine is just about 100% Napa Valley, I believe it is age-worthy. 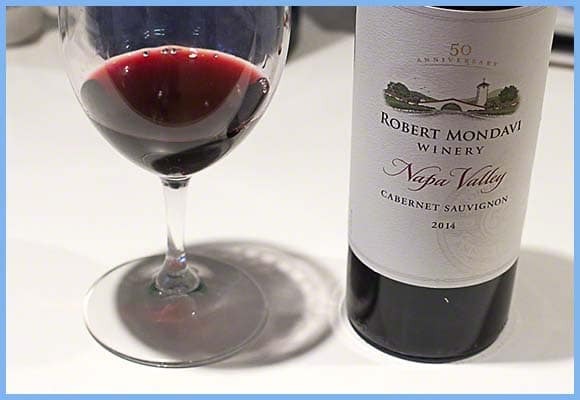 I recently brought a 2005 Robert Mondavi ($15) to a nice restaurant. The wine was beautifully aged and outstanding in quality. **We love going to a small neighborhood Chinese restaurant. The owner has one red and one white wine on his wine list. We always bring in a bottle of good cheap vino, and he never charges us a corkage fee.